Our technology is revolutionary. In 2014 we successfully presented SmartcanMax™ to change the NSF Class 21 Standards. When used with a liner bag, SmartcanMax™ is fully compliant. We are proud of this accomplishment to increase user safety. Combining our patented waste and recycle receptacle, SmartcanMax™ with Recycle Across America® standardized labels supports environmental and human sustainability. Increase recycle and waste capture rates as much as 50-100% while decreasing expensive workers’ compensation claims by utilizing standardized labels on SmartcanMax™. An ergonomic hazard is a physical factor within an environment that harms the musculoskeletal system. Ergonomic hazards include repetitive movement, manual material handling, and workplace tasks that place the user at risk with poor body positioning. SmartcanMax™ reduces risk by 100% eliminating the suction and vacuum that causes bag struggle, allowing the user to get in an ergonomically neutral bag removal position every time. SmartcanMax™ is the safest toughest easiest waste receptacle. Other trash cans get holes in the bottom in no time - not SmartcanMax™. We have designed and over engineered SmartcanMax™ components to offer years of service, not mere months. Our 5-Year No Holes Warranty is an industry first. Did you know back injuries are OSHA’s #1 reported worker incident, at an average medical cost of $37,000? Employers pay almost $1 billion per week for direct workers’ compensation costs alone, or $52 billion annually. Direct costs include workers' compensation payments, medical expenses, and costs for legal services. Indirect costs can double the final cost and include: training replacement employees, accident investigation, implementation of corrective measures, lost productivity, repairs of damaged equipment and property, and costs associated with lower employee morale and absenteeism. Over 1 million service workers suffer back injuries every year, the #1 workplace safety problem. SmartcanMax™complies with OSHA’s recommendation for garbage liner removal and lifting techniques and used with a liner bag meets NSF Class 21. 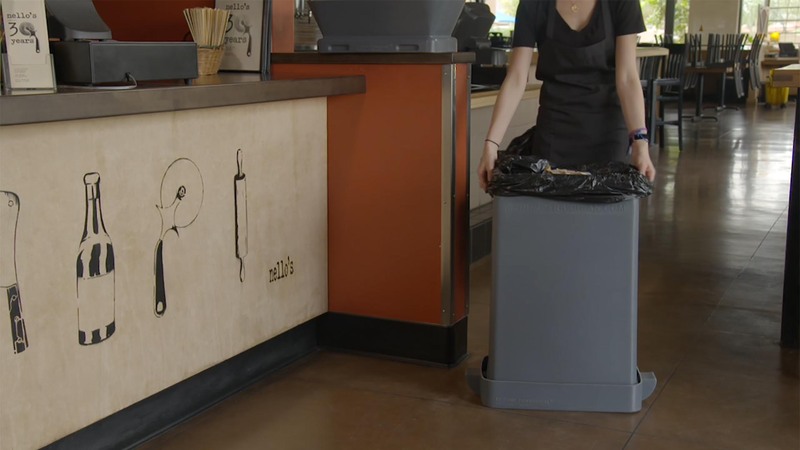 The potential for reduced job injuries by providing workers the ability to utilize a proper lifting position and two hands when removing trash can save you and your business money. It is easier to clean too. © Copyright 2018 EZ Dump Commercial, Inc.